Characterizing ionic currents. Negative voltage steps from a holding potential of -50 mV were used to characterize the ionic currents. Three examples of current responses to voltage steps of -4, -28, and -56 mV are shown. The input resistance (Rin) was measured from the amplitude of the current response to a -4 mV voltage step as shown on the trace (Ileak). The afterhyperpolarizing current (IAHP) was measured from the baseline to the peak of the outward current at the end of the voltage step. The IAHP current is a mixture of h current and possibly Ca 2+-dependent K + current. The Ih was measured as the difference between the initial current and the steady-state current developed at the end of the hyperpolarizing voltage step. The capacitance was calculated from the integral of the capacitive current induced by a -4 mV voltage step (inset A). The area to integrate was limited to the fast transient only (horizontal bar). As expected, this definition resulted in a linear relationship between the input conductance and the cell capacitance, as demonstrated in Figure 2. The calcium current is enlarged in inset B, and the amplitude is measured as shown. The measured input resistance (Rin) is correlated with the calculated capacitance. 1/Rin is linearly related to the capacitance (R2 = 0.76 for wild type and R2 = 0.85 for knock-out). The slope of the linear feet gives us the average time constant of these cells (τ = 3.7 msec for wild type and τ = 6.03 msec for knock-out). WT, Wild type; KO, knock-out. Ubiquitous distribution of Cx36 mRNA in the inferior olive of the mouse. A, Low magnification of labeled olivary neurons in medial accessory olive, dorsal accessory olive, and principal olive after in situ hybridization; with the use of Cx36 antisense probes, all neurons of all olivary subnuclei of wild-type (WT) mice were positively labeled. B, High magnification of labeled neurons in the medial accessory olive. C, In contrast, none of the olivary neurons in Cx36 knock-out mice were labeled with the use of antisense probes. Scale bars: A, 100 μm; B, 20 μm; C, 120 μm. Punctate labeling in olivary neuropil after immunocytochemistry with the use of anti-Cx36. A, In wild-type mice, the entire neuropil was filled with labeled puncta; this micrograph shows an example of labeling in the smallest olivary subnucleus, the dorsal cap of Kooij (IOK). B, In the Cx36-deficient mouse, no puncta were visible. x, Examples of cell bodies. 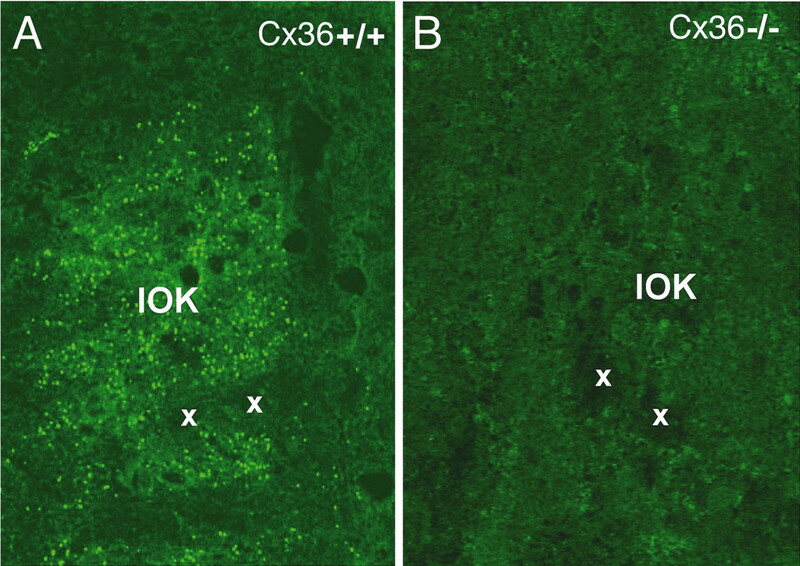 Rapid Golgi staining of olivary neurons in wild-type (WT) mice (A) and Cx36-/- mice (B). Note that the proximal dendrites of Cx36-/- mice are thicker than those of the wild-type mice. The magnifications of A and B are the same. Scale bar, 9.7 μm. Ultrastructural characteristics of a dendrodendritic gap junction in the inferior olive of a wild-type (WT) mouse. 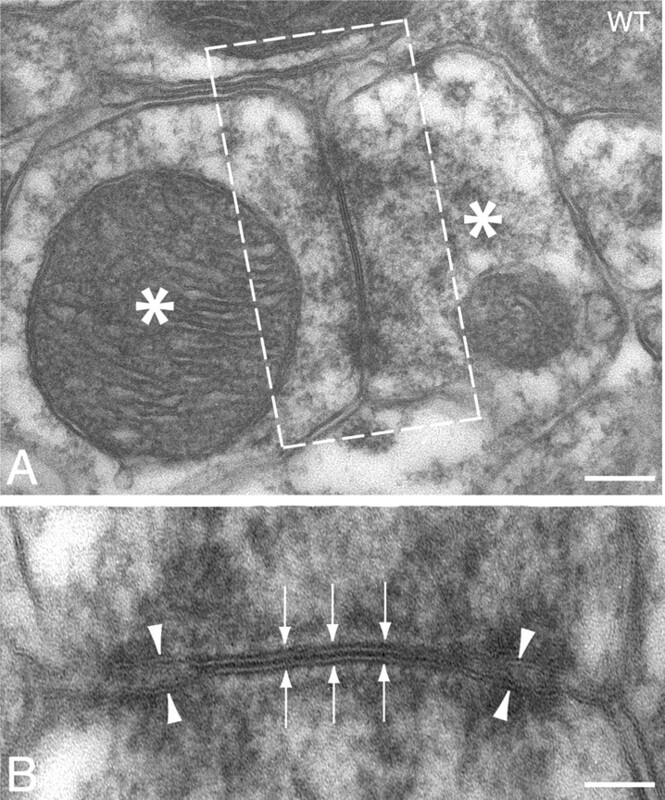 In wild-type mice, the gap junctions between olivary dendritic spines (asterisks) showed electron-dense deposits in the cytoplasm at both sides of the membrane; in addition, they had attachment plaques (arrowheads) surrounding the plaque with gap-junction channels (arrows), and the interneuronal gap of this plaque was ∼3 nm thick. B shows a higher magnification of the inset depicted in A. Scale bars: A, 167 nm; B, 82 nm. 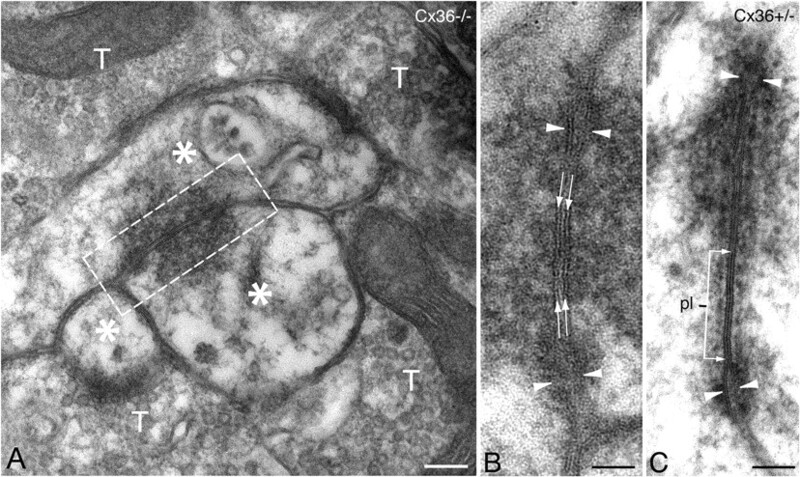 Ultrastructural characteristics of a dendrodendritic gap-junction-like structure in the inferior olive of a Cx36-deficient mouse (A, B) and a Cx36+/- mouse (C). 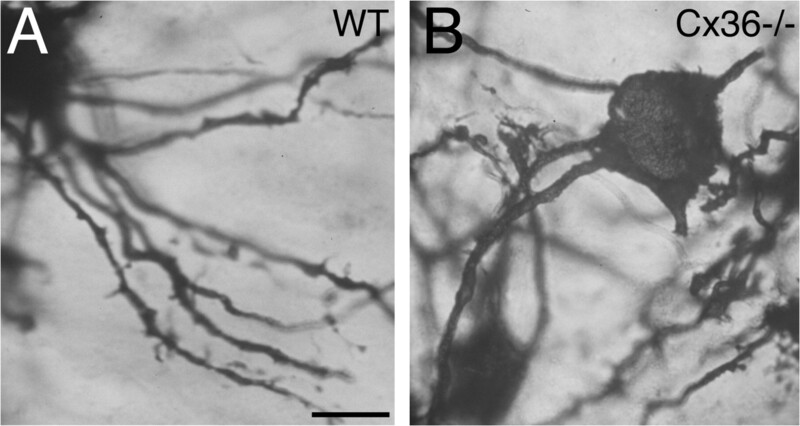 In homozygous Cx36-deficient mice, no normal gap junctions were observed, but instead the dendrites showed numerous gap-junction-like structures with a widened interneuronal gap of ∼9 nm (arrows in B). Note that the micrograph in A shows a typical olivary glomerulus with a core of dendritic spines (asterisks) surrounded by terminals (T) and glia. In heterozygous Cx36-deficient mice, the olivary gap junctions showed a normal interneuronal gap of ∼3 nm, but the average diameter of the plaque (pl in C) was significantly reduced, whereas the distance between the attachment plaques (arrowheads) remained normal. B shows a higher magnification of the inset depicted in A. Scale bars: A, 150 nm; B, 75 nm; C, 105 nm. Histograms showing morphometrics of gap junctions and gap-junction-like structures in wild-type (WT), Cx36+/-, and Cx36-/- mutants. A, The average interneuronal space of gap-junction-like structures in Cx36-/- mutants was significantly smaller than that of gap junctions in wild-type and Cx36+/- mutants. 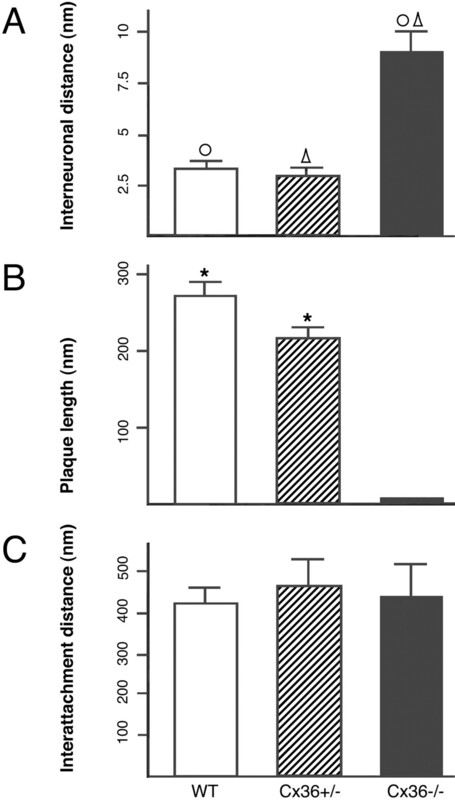 B, The length of the gap-junction plaque in wild-type mutants was significantly longer than that of Cx36+/- mutants, whereas it was absent in homozygous Cx36-deficient mice. C, In contrast, the distance between the attachment plaques did not differ among the three groups of animals. For visualization of parameters, see Figure 7. Open circles and triangles indicate p < 0.0001; asterisks indicate p < 0.001. Dye coupling in wild-type mice (A) and homozygous Cx36-deficient mice (B). 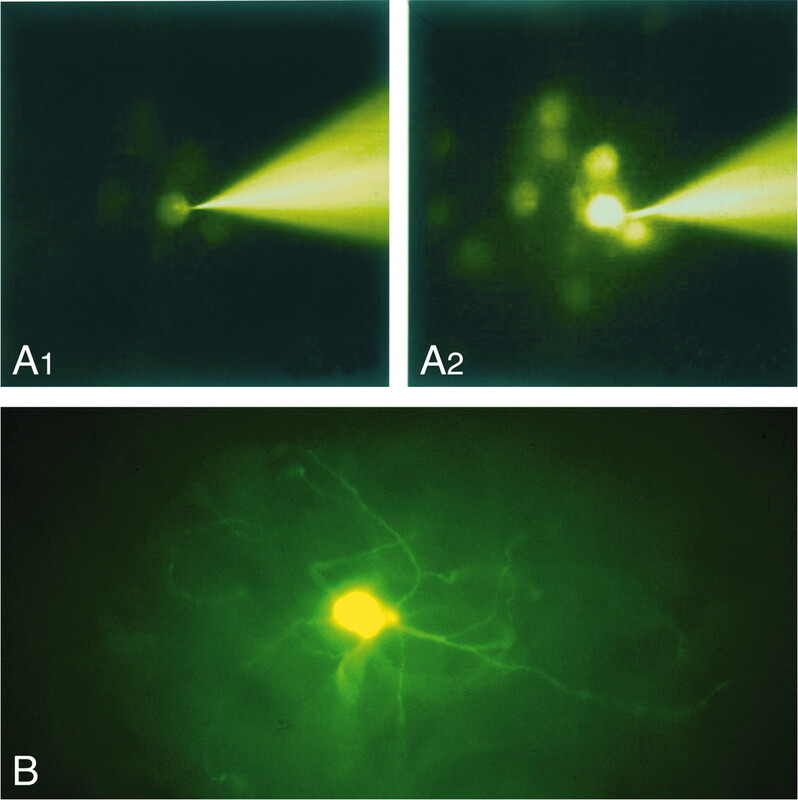 A, In slices of the inferior olive of wild-type animals, intracellular injections with Lucifer yellow provided clusters of approximately nine neurons within a few minutes; the time difference between micrograph of A1 and A2 is 136 sec. B, In contrast, injections in slices of Cx36-deficient mice yielded single labeled neurons; note the absence of labeling in neighboring cells despite the visualization of olivary dendrites. 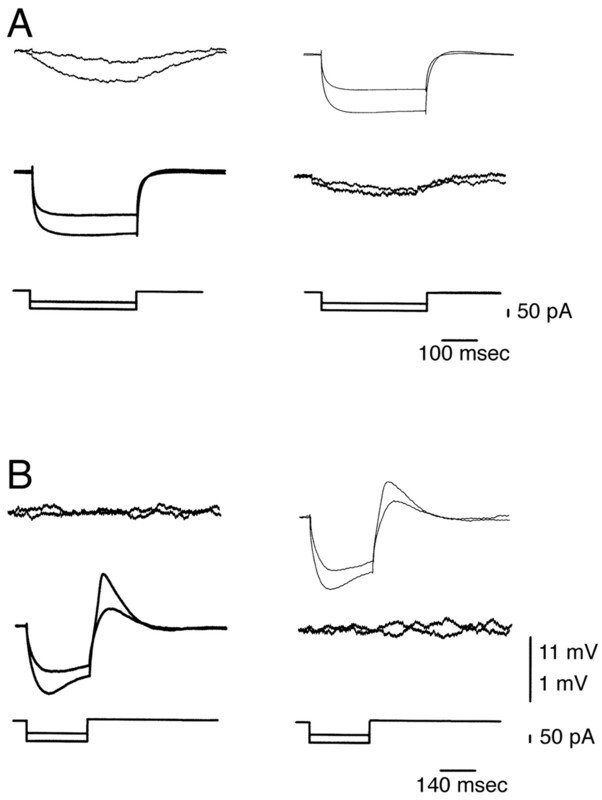 The absence of direct current flow between adjacent olivary neurons from knock-out mice. 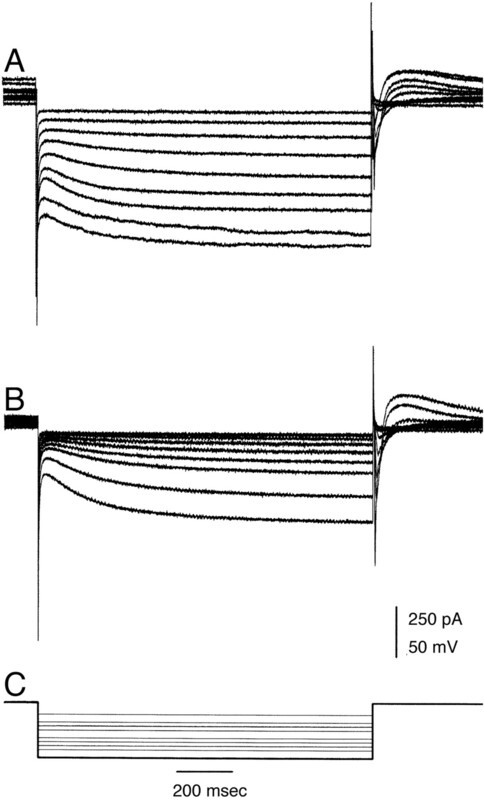 Dual recordings from olivary slices were performed in wild-type mice (A) and knock-out mice (B). In wild-type mice, current injections into cell 1 (middle) induced direct voltage responses in cell 1 and an indirect response in cell 2 (top).This current flow was bidirectional (right), indicating that these neurons are electrotonically coupled. In knock-out mice (B), indirect voltage responses were absent. 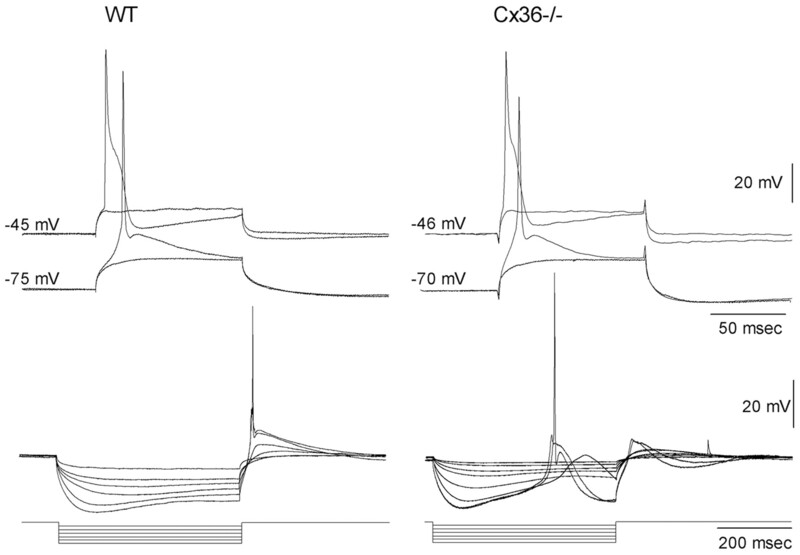 Olivary neurons from Cx36-deficient mice are more excitable at hyperpolarized states. Whole-cell patch recordings show the responses of olivary neurons from wild-type (WT) mice (left column) and mutant mice (right column) to depolarizing (top) and hyperpolarizing (bottom) current injections. The depolarizing pulses (top) elicited high- and low-threshold calcium responses (top and bottom traces, respectively) in both wild-type and Cx36-/- mice. The response to hyperpolarizing current steps of mutant mice is characterized by an activation of a low-threshold calcium spike that triggered a sodium-dependent action potential. 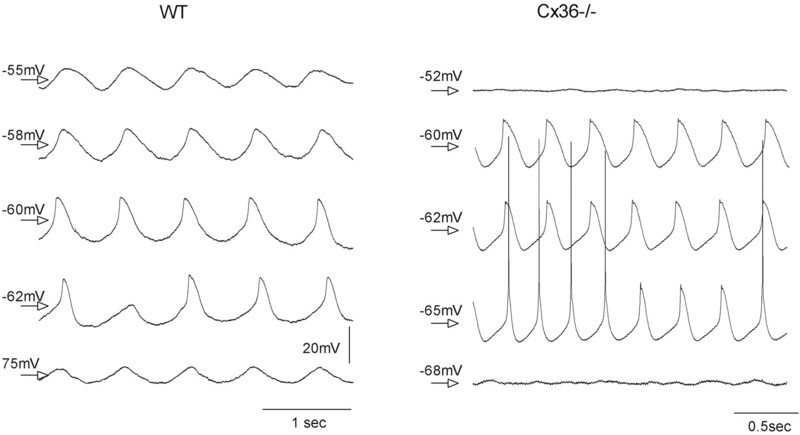 Oscillations are voltage dependent in the Cx36 knock-out mice (right) and independent in wild-type (WT) mice (left). Each panel shows five traces recorded at a different membrane potential, which was set by DC injection. The average voltage of each trace is marked (arrow). In mutant olivary neurons, the oscillations occurred at a limited range of voltages (traces 2–4), which does not include the resting potential (trace 1). 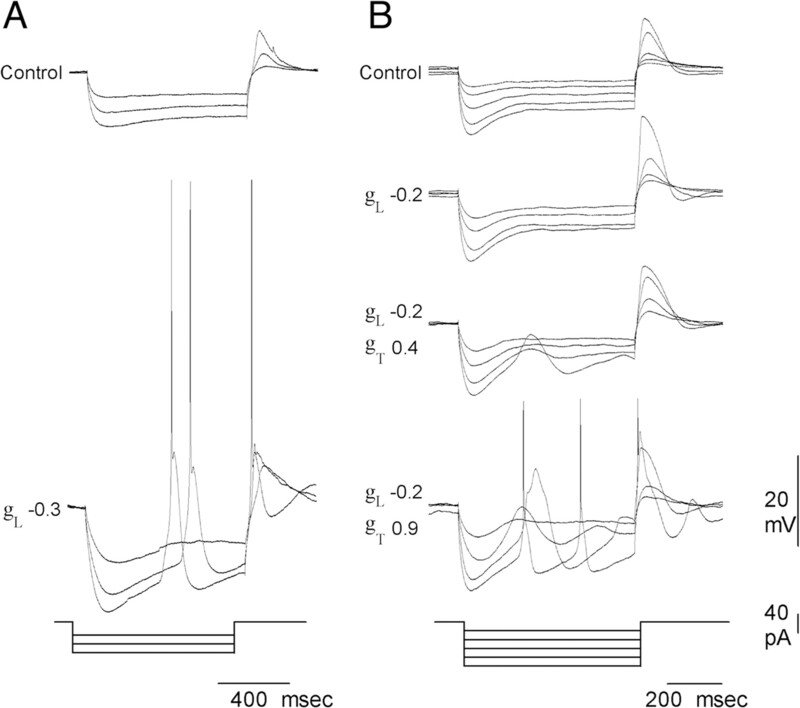 In wild-type mice, the oscillations occurred at all levels of membrane potentials. Current responses of wild-type and knock-out neurons to negative voltage steps. An example of the current responses of wild-type neurons (A) and knock-out neurons (B) to negative voltage steps is shown. Note that knock-out neurons have larger input resistance and larger calcium currents than wild-type neurons. 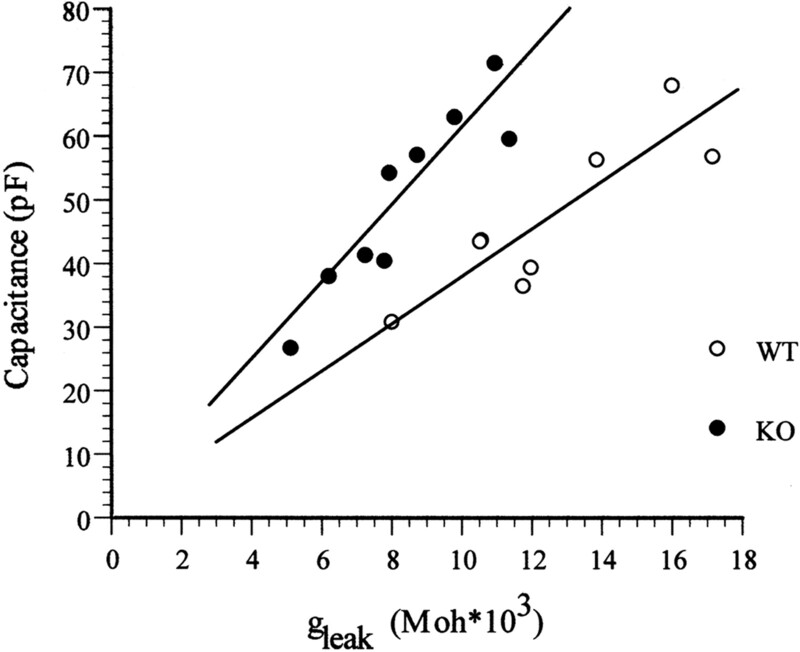 Changing leak and/or low-threshold calcium conductances can mimic mutant properties in wild-type mice. The dynamic-clamp technique was used to alter the leak and calcium conductances. Each panel shows the voltage response to series of negative current injections (bottom panel). The control responses are shown at the top of each panel. The responses of the dynamically clamped cell are shown below. A, Only a 200% increase in resistance of the cell could reproduce a knock-out-like phenotype. 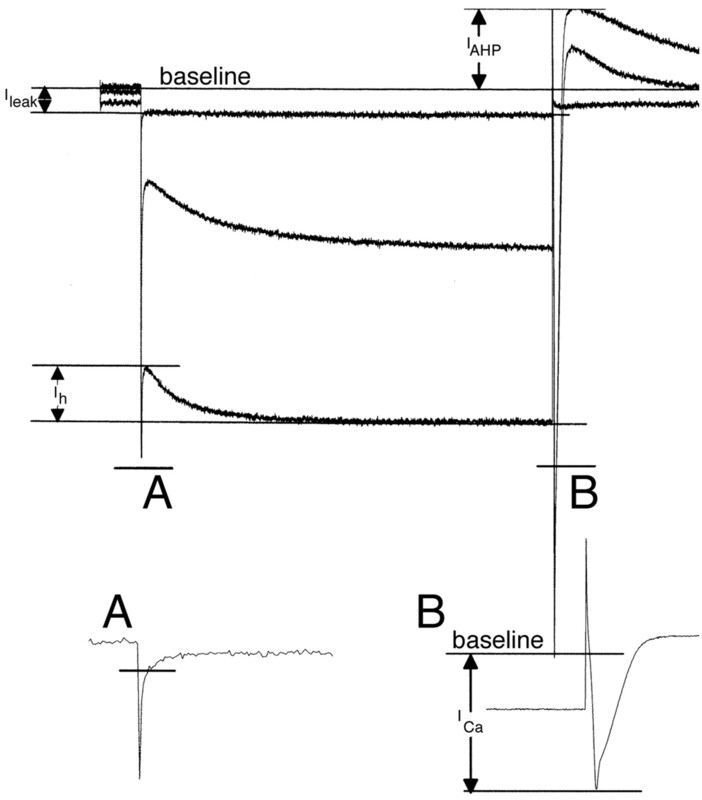 B, Reducing the leak conductance by 20% is not sufficient for reproducing the mutant phenotype (i.e., increased excitability manifested as a calcium spike and action potential from a hyperpolarized state; compare top panel with the second panel).An increase in low-threshold calcium conductance enhances the sag (third panel), and an additional increment of low-threshold calcium conductance results in a low-threshold calcium spike and action potential similar to the phenotype of the mutant. Std, Standard; WT, wild type; KO, knock-out.